One of the hallmarks that stands out to me about French cooking is their love of soups, particularly vegetable soups. Have you heard of the velouté? This word translates literally to “velvety” in French and there are many vegetable soups that are pureed to be “velvety” on French home-cooking and restaurant menus. I have a long list of these soups to make, but for no reason in particular, asparagus velouté drew me in. Perhaps because never before French cuisine would I have considered to make a soup out of asparagus… and the truth is: I’ve been missing out! In France, veloutés are made both with and without cream. Oftentimes these soups will be made with a potato base to lend creaminess. And, of course, heavy cream plays a role in plenty of recipes, too. Cashew-hemp milk is incredibly easy to make in a few minutes (post-cashew soaking time) and have on hand. Don’t worry: if you feel like me and don’t understand the role of “nut milk bags” and straining nut milks, rest easy. There is no straining the nut milk involved. This recipe is absolutely not complicated. It involves a little blanching (a new term for me these days–fancy way of saying boil for a few minutes then make cold). Also, a little boiling and blending is involved. Simple, simple, simple! You can’t mess it up with these ingredients, too. What is important is choosing your asparagus well. My mom taught me to always choose the bunches with the skinniest stalks. I honestly don’t know if that’s based in anything solid, but it has always worked out for me. 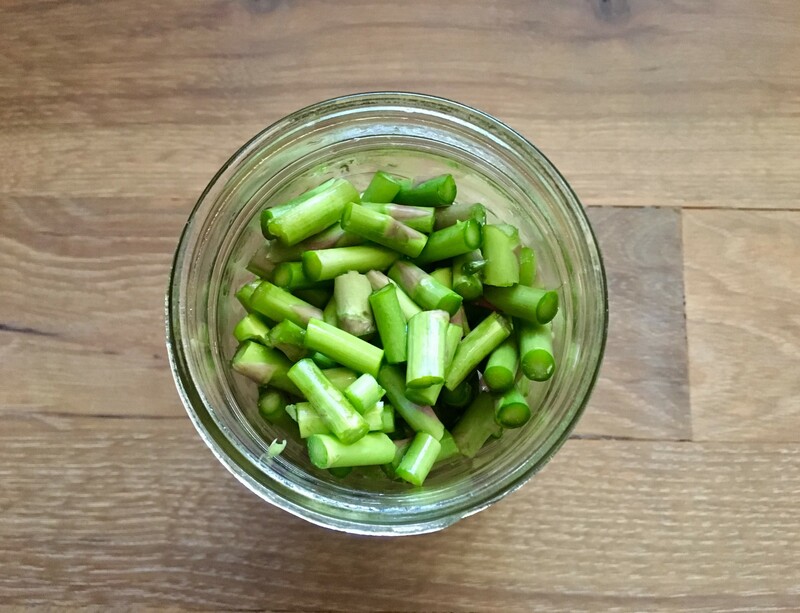 When you bring your asparagus home, put them in a wide-mouthed jar or glass with a little water at the bottom like they’re flowers. Top them with an open-bottomed plastic bag and keep in the fridge. If the asparagus are tightly bound with a rubber band, remove that as well and let them breathe. 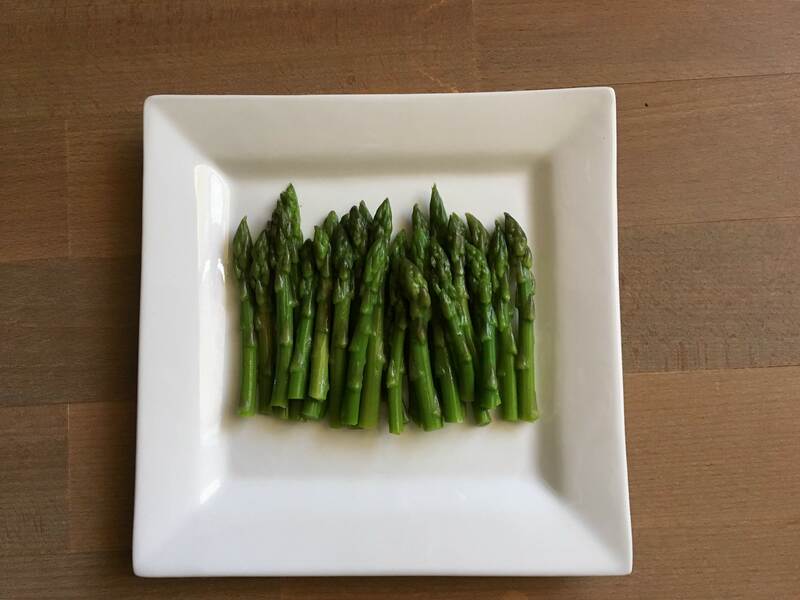 My asparagus sat like a little fridge bouquet for a 3 days before I made this recipe, so you have wiggle room if you’re not inspired to shop and soup on the same day. I was so excited about the final result of my blanching, boiling, and blending. This soup is delicious. It’s creamy without being heavy, comforting without making you want to lie around afterwards, and refreshing all at the same time. The finished color is such a subtle representation of the word vert. I love it in the white mug that I repurposed from my daily milk latte days. 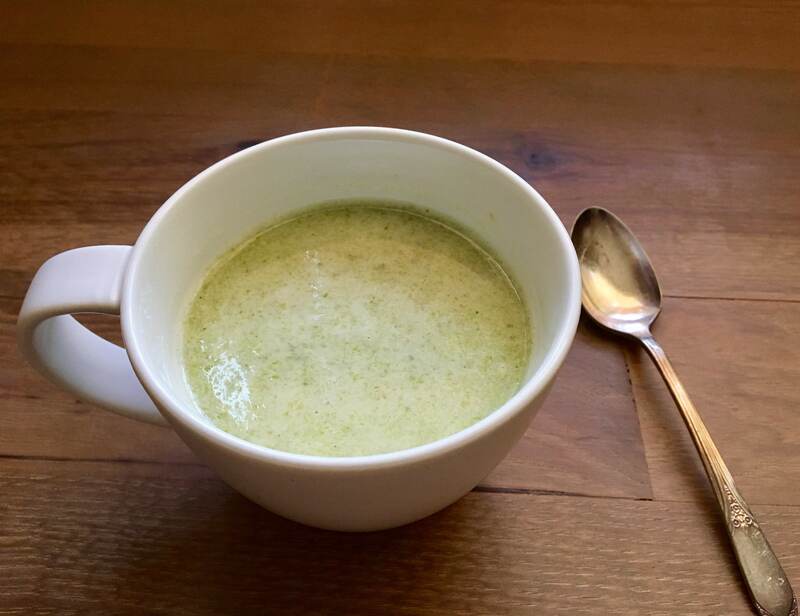 I received the inspiration for this recipe from Martha Stewart’s Cream of Asparagus Soup. This is a vegan, lower-fat, no-oil, low-salt version for your enjoyment. Serve this soup as a main or alongside whole grain bread and side salad with beans. 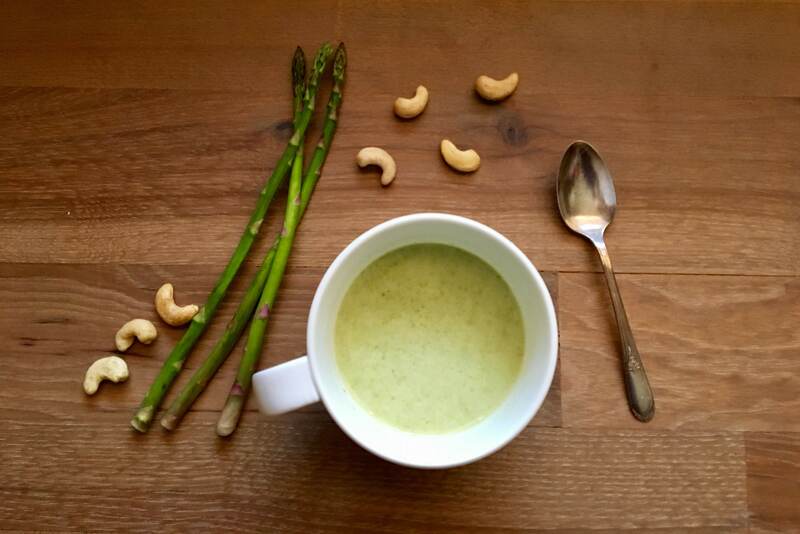 Creamy Asparagus Soup is a comforting and nourishing yet light non-dairy, vegan soup to enjoy on a bright summer day or warm up and sip while listening to a nighttime thunderstorm. Wash the asparagus and trim the bottom ends off. I usually do this by hand, snapping the bottom off approximately 2-3 inches from the bottom where it naturally breaks. Trim approximately 2 inches off of the top of 10 asparagus spears if you’d like to add garnish decoration later. Set aside the bottom trimmings to make vegetable stock. Cut the remaining asparagus spears into 1 inch pieces. Boil 6 cups of water. 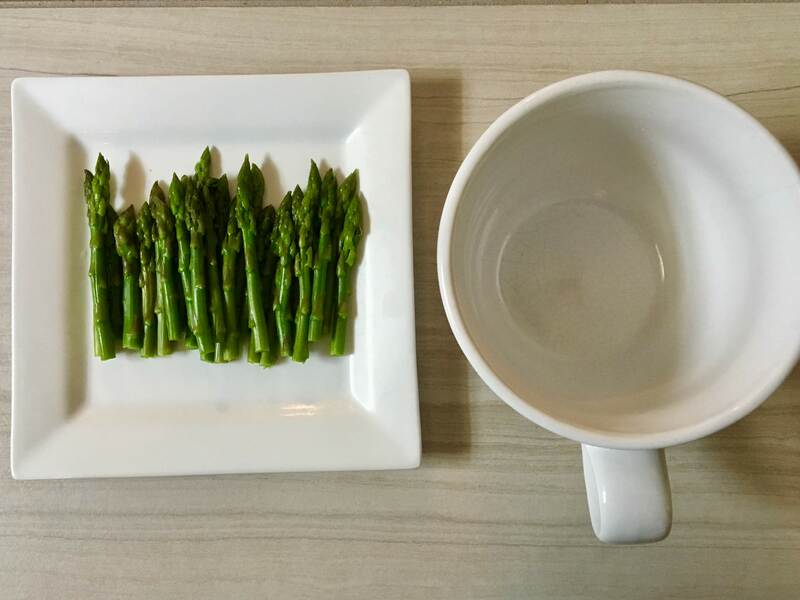 Place the asparagus tips (if using for garnish) in the boiling water for 2-3 minutes until they are bright and tender. Remove the asparagus tips with tongs or slotted spoon, place them in an ice bath to stop cooking, and once cooled, place on a towel to dry. Keep the boiling water going. Save the blanched tips covered on a plate in the fridge. Add the trimmed asparagus bottoms, 1/4 diced onion, 1/2 garlic clove, dash of salt to the boiling water and simmer for 20-25 minutes to create a light broth. As the broth is finishing up, in a second medium saucepan, saute 1/4 diced onion and 1/2 garlic clove until tender. Either strain out the vegetable broth or (what I did) use a soup ladle to transfer the broth from the first saucepan to the second. Avoid bringing trimmed bottoms into the new saucepan, but onions and garlic can transfer with the broth. Add chopped asparagus pieces to the second saucepan containing onions, garlic, and simmered broth. Bring to a boil and then lower heat and simmer for approximately 5 minutes until the chopped asparagus is tender to a fork. Take this mixture off the heat and allow to cool for 10-15 minutes. Add cashew-hemp milk 1/2 cup at a time until desired creaminess is reached. I used approximately 2-2.5 cups of cashew-hemp milk for 5 cups of asparagus mixture (1:2 ratio). Serve topped with tips as garnish and sprinkled lightly with salt (if desired) and fresh ground pepper. Serve warm or at room temperature. Will keep in fridge for approximately 5 days. Take care not to blend boiling or very hot liquids. If your soup is creamier (more cashew-milk added), the will asparagus spears will likely float at the top. My soup wasn’t thick enough for floating the tips, so they sank. They were still tasty bites in the soup, though!